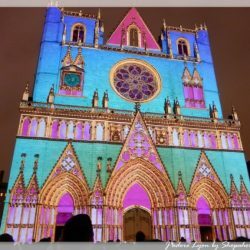 Our American contributor Jenna enjoyed the 2016 Fête des Lumières in Lyon despite of the crowd. 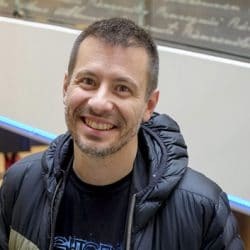 A story about vin chaud, mud, churros, machine guns, music and flames. Friday, December 9, 2016. 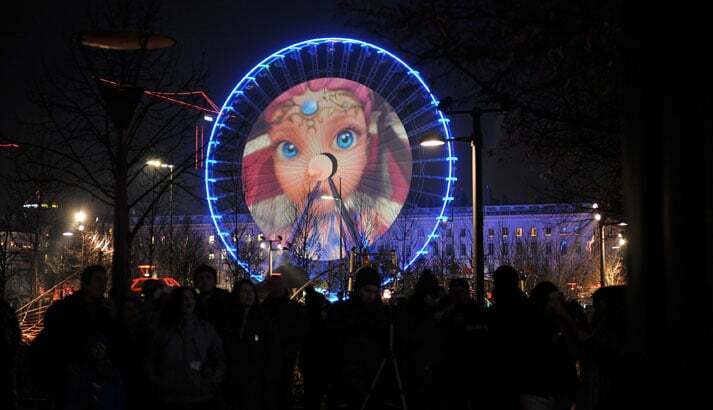 Lyon, Fête des Lumières. Madeleine and I half-walked and half-ran past L’Université Lumière Lyon 2, the school that had held us captive in the days leading up to this long-awaited weekend. 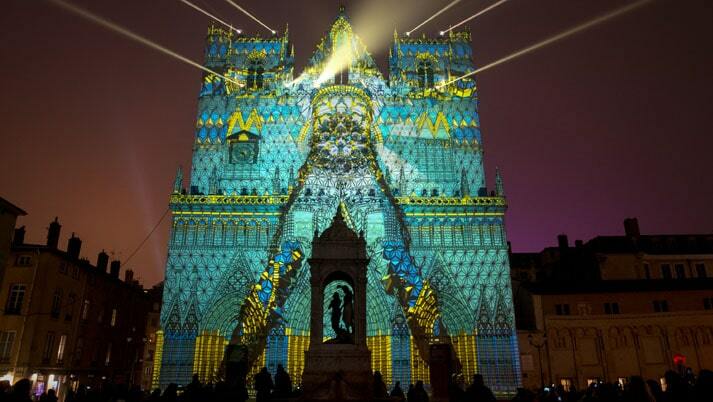 As American students, we had heard all about the Fête des Lumières from our study abroad program. 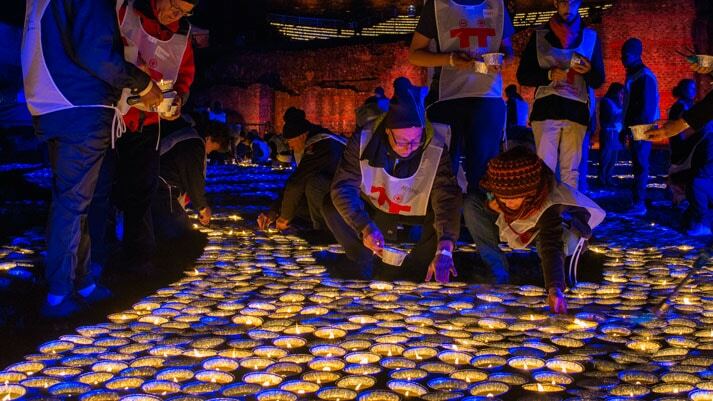 We had heard of the incredible light displays, of the crowds and parties all over the city, of how last year’s program had been turned into a tribute to the victims in Paris. It was for that reason that we had held back yesterday. 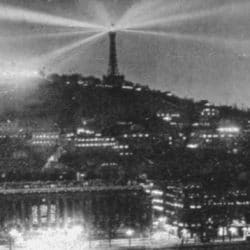 There were new security measures, and the Fête had been scaled way back, to the main parts of the Presqu’île and Vieux Lyon, but we still wanted to be careful. Going out the first night seemed like tempting fate. But we weren’t about to miss it completely. We weren’t going to let fear stop us from experiencing one of the things Lyon is most known for. 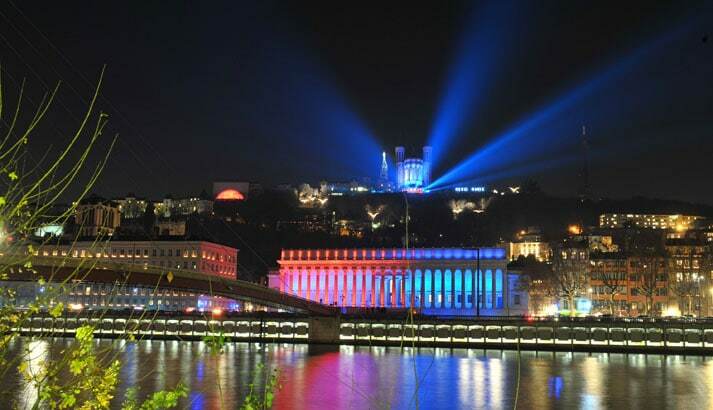 Everything you need to know about 2017 Lyon Festival of Lights. So we bundled up and set out, soon realizing that we hadn’t bundled up quite enough. By the end of the night, our hands would be so frozen we could barely stuff our faces with the 10 churros we didn’t have the willpower to resist. They were great, by the way. Our first target was the Cathédrale Saint-Jean. Of our friends who had gone out on Thursday, that was what they recommended. A cascade of green and blue lights. Explosions synchronized with epic music. And of course, crowds pouring out of every orifice of the square. And Madeleine was right. There was, quite literally, not one single way into that crowd. We could hear the music starting. We were right around the corner, where the metro meets the bridge, but we were going to miss it. I looked in front of me, to where people mulled about, not moving. I looked to my left: movement. Weaving through bunches of bundled people, we slipped into an alley and around a building to the back of the square. We could see it now, barely, packed like a can of sardines. -“I don’t want to be in that crowd,” Madeleine noted. “Yeah, neither do I.” As much as we wanted to relax and enjoy the festivities, and as much as I was completely terrified yet thoroughly appreciative of the giant men with machine guns slung over their shoulders, we couldn’t completely let go of our apprehension. You never know. I looked to where Madeleine was pointing. Just beyond the square where the view opened on Fourvière, people were skirting around the edge of the fence and hiking up to get a better view. We stumbled over ourselves and the people around us on our way around the fence. Our shoes slipped on a combination of mud and wet leaves. I grasped at the bushes and branches scraping past my face. One-quarter walking and three-quarters clawing our way up, we braced ourselves on the 60° hill just behind a photographer. If he could manage this slope, camera equipment and all, we could certainly manage to stand upright. Or squat, at least? I looked down, and was greeted by my new boots, soaked in mud. I looked up, and was greeted by the view from above the crowd: a kaleidoscope puddle of green, a ripple of energy pouring out from the stained-glass window of the cathedral. Electronic music trickled behind, twinkling as the puddle swelled. A minute later, a swarm of red washed up the façade, mimicking the leaves of the autumn just gone. The stained-glass multiplied, and collapsed in on itself a second later. Reds, blues, yellows, and greens twisted and melded, pulsing, waving, dissolving. The music, a trance-inducing sci-fi mix, quickened its pace. The crowd murmured. The lights flashed, strobing across our eyes in a myriad of colors. And then it was over. We came prepared this time. After we stumbled back to our apartments the night before, it had taken a good hour for us to thaw out of the icicles we had become. So tonight we were ready, with scarves, hats, and mittens in tow. And boy, were we sweating. Having accomplished Vieux Lyon and the Presqu’île the night before, complete with the 10 churros, crepes, and vin chaud that Madeleine promptly spilled all down her front, we hopped on the always amusing funiculaire up to the Théâtre Gallo-Romain. Confronted at the top by another horde of people, this time disorderly crammed between metal gates, we nearly gave up. 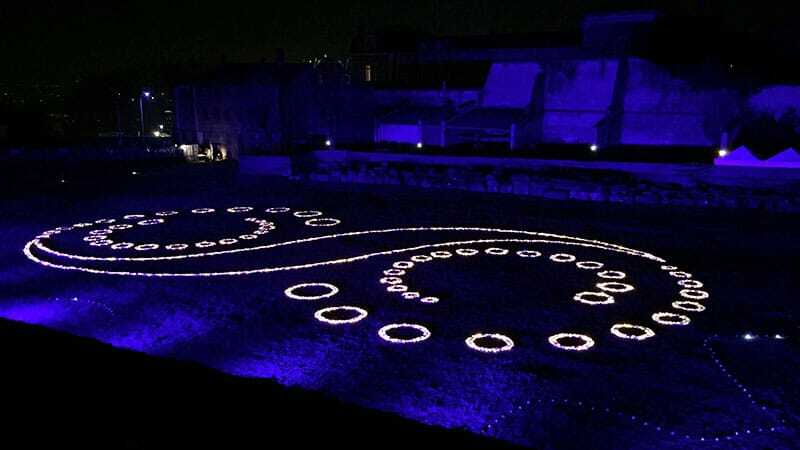 We contented ourselves watching the flickering votive candles arranged in a swirling figure-eight at the bottom of the theater. Our bags were checked and we broke free into the rocky semi-circle. Winding our way through the line, we somehow scored ourselves front-row spots on the right edge of the theater. We whipped out our phones, ready to capture the moment as any social-media savvy millennial would. The music started. The theater steps filled with the blue-grey light of a storm. And from that moment, I didn’t care what my phone was recording. 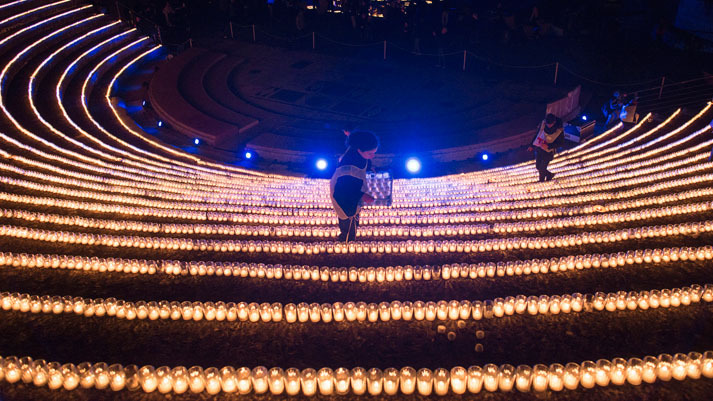 Our eyes riveted on the steps, we watched a flame appear. A person carried it through time and space. The music crescendoed through the air, and stalled. The arena went dark. A boat sailed across an ocean of blue light under a full moon. The music trembled. The ocean dissolved into a flaming spiral, sweeping outward into the darkness, consuming itself. The flame pulsed, convulsing in a fit of calm energy. The stairs twinkled. The stars appeared. A blue glow turned red and disappeared. The music expanded. Flames exploded, illuminating the ancient rocks. It went silent. For ten minutes, we didn’t care if we were freezing or sweating. We didn’t think about taking good videos or photos. We didn’t worry about the men with machine guns, or the people they were there to stop. I had to actively stop myself from dropping my phone over the barrier and into the dirt on the theater floor. Leaving the theater after the show, we veered left to avoid the crowd headed into the funiculaire. The traffic was stopped for the festivities, so we had the road to ourselves. We spread out across the two lanes, threw our arms out to the side, and ran. Gravity dragged us down the cobbled street, past the looks of surprised passers-by, around the curving city walls and houses. Wind screamed around us. Our feet skimmed the ground rushing up underneath us. I cracked a smile, and broke out into laughter. At the bottom of the hill, we hit a staircase. We stopped to catch our breath. We looked around us, and saw the city lights twinkling down below: Lyon, lit up in color, stretching out below our feet. 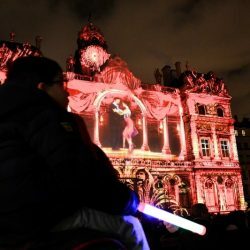 Photographer and visual artist, Guillaume J. Plisson, specialist in Lightgraff, unveils his top tips to take stunning pictures during the Festival of Lights.